The Bronx Long Term Recovery Group headed up a 4-series workshop to prepare the Bronx for any disaster. Partners included: The Salvation Army, DOHMH, OEM, and The Center for Community Leadership at JCRC-NY. Community members and leaders from across the Bronx attended The Bronx Forum: The Changing Political Landscape and What You Need To Know to discuss with experts how the changes across city government will have an effect on non-profits and community-based organizations. 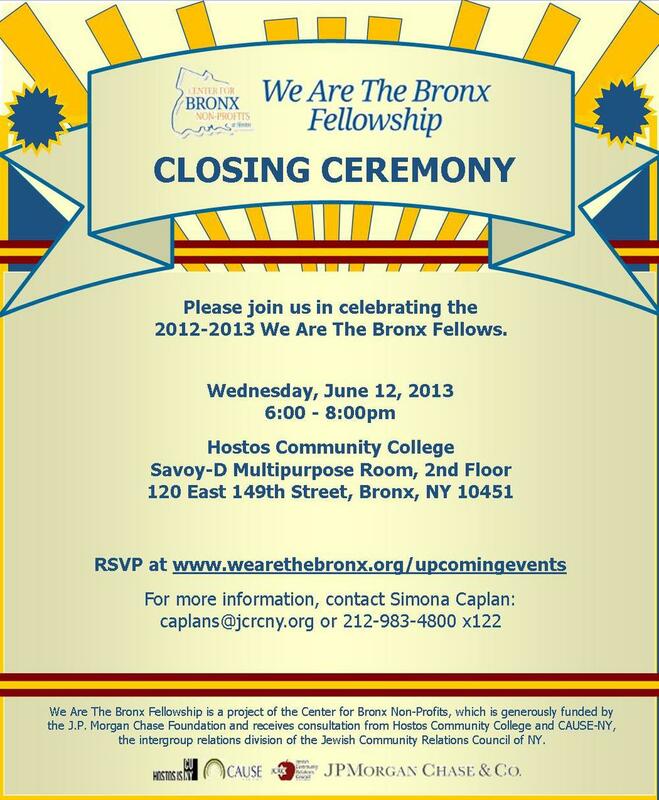 Friends, family members, and colleagues celebrated with the We Are The Bronx Fellowship class of 2012-2013 at their closing ceremony! Community members joined We Are The Bronx Fellows at their event promoting the 2013 Bronx Community Impact Auction to bid on exclusive items and network with other nonprofit leaders. Bronx community members and leaders joined the Bronx Clergy Roundtable, Jewish Community Relations Council of New York, and the Consulate General of Israel in NY for an interfaith Bronx Clergy Passover Seder: Celebrating the Journey to Freedom. Bronx faith-based leaders came together to learn about Congregational Disaster Preparedness.